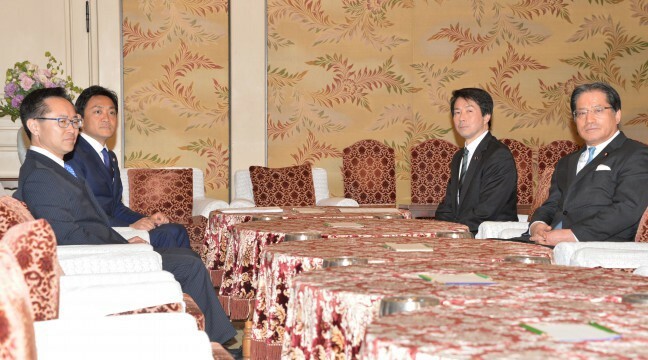 On the evening of April 9, DP President Kouhei Ohtsuka and Party of Hope President Yuichiro Tamaki held a leadership meeting inside the Diet to confirm their aim to form a new political party. During the meeting, the two leaders agreed that they would aim to unite like-minded colleagues to form a new party in order to create, at the earliest possible opportunity, a political system which allows changes of government and protects democracy and citizens’ lives. They also confirmed that the two parties would: (1) establish a New Party Discussion Committee (provision translation) comprised of senior members from both parties, (2) establish two exploratory committees under the New Party Discussion Committee, one relating to basic principles and policies, and the other to organization, party regulations and elections, and (3) obtain the approval of both parties in view of the results of deliberations in the New Party Discussion Committee. Following the meeting, the two party leaders held a joint press conference. The first meeting of the New Party Discussion Committee was held following the press conference.